Chalk paint is a unique and easy-to-use type of paint that is popular for crafting. It can be used on small projects like picture frames, or on larger projects like pieces of furniture. The best part about this paint is that you don't have to spend a lot of time prepping the surface before you apply the paint. Instead, you can just start painting. This makes it fast and easy to finish projects. Off-White or Cream. 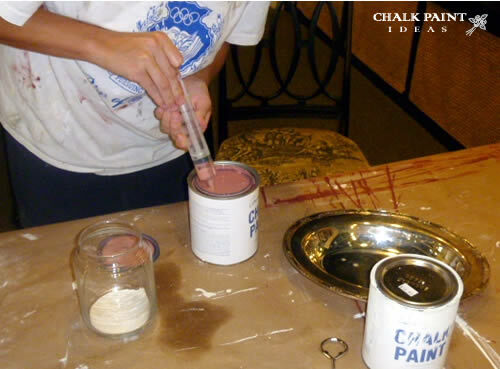 Originally, chalk paint was only available in a soft, off-white color similar to the color of chalk. That and its matte texture are how it got its name. Today, this original creamy-white color is still extremely popular. It is often used to create distressed furniture pieces or mirror frames for shabby chic decor. It is also a perfect choice for beach-inspired decorating since it gives a light, airy feeling to a room. Pink. Soft and feminine, pink is ideal for a little girl's room, but works equally well in any space where you want to add a touch of romance or femininity. This is another color that looks beautiful when distressed. By sanding it down a little and allowing the underlying wood to show through, you can create a piece that has a lovely vintage vibe. Turquoise. Bright and vibrant, turquoise is the perfect choice if you want to add a bold pop of color to your space. This highly saturated hue is absolutely breathtaking. Whether you use it on a small object like a vase to create a tiny accent piece, or on a large piece of furniture to create a bold focal point, this stunning shade is hard to miss. Olive Green. Perfect for traditional or country decor, olive green provides a hint of color without overpowering the space. This subtle color looks especially beautiful when it is lightly distressed and finished with a coat of dark wax over the top. Pale Blue. Soft, baby blue can provide a lovely accent for a boy's room, or can be used to bring a sense of peace and calm to your space. Reminiscent of the ocean or of a cloudless sky, this relaxing color is the ideal choice for a bedroom. Red. If you are looking for the ultimate in drama, opt for red chalk paint. This rich, saturated hue can have a major impact on your space. Again, like turquoise, you can use it to paint small objects for a subtle punch of color, or go all-out with a full sized piece of furniture to create a striking centerpiece for your decor. 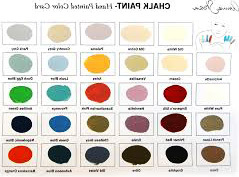 These are just a few of the many chalk paint colors that are available. When choosing a color, think about the overall feeling that you are trying to create in the space. Pale, muted colors tend to be relaxing, while bright, vibrant colors tend to add energy to the space. Related Post "Popular Chalk Paint Colors"